Vamana Jayanti is celebrated to worship the fifth incarnation (avatar) of Lord Vishnu as Lord Vamana. The festivities of Vamana Jayanti takes place on the twelfth day of Bhadrapada month in the Shukla Paksha as per the Hindu calendar. Vamana Jayanti falls either in August or September as per the Gregorian calendar. Lord Vishnu incarnated as the son of sage Kashyapa and his wife Aditi and was popularly known as Vamana. As per the Hindu Scriptures, if a person worships Lord Vamana, the individual gets free from all kind of sufferings and sins and achieves salvation. Vamana Jayanti Vrat is observed with great joy and extreme devotion at various parts of India. As per the Hindu beliefs, the devotees who observe this fast are blessed by Lord Vishnu, the preserver of this Universe, and are granted forgiveness for all their past sins. 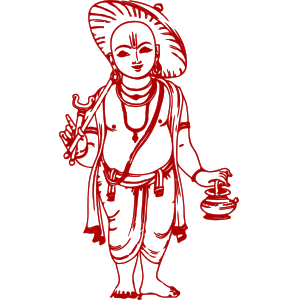 When is Vamana Jayanti Fast? To know date visit Hindu Calendar. What is the Story of Vamana Jayanti? As per the Hindu Mythology and Shastras, the one who will perform the 100 complete Yagnas will attain the power and competence to rule the Earth as well as the Heaven. King Mahabali, was the biggest devotee of Lord Vishnu but still was regarded as a huge threat for the deities or the devas. He started performing the 100 yajnas. Lord Indra approached deity Vishnu to seek his support as he was scared that King Mahabali could become the ultimate ruler. He requested Lord Vishnu to help in preventing him from completing the Yagna and becoming the ruler of the entire universe. To the appeal of Lord Indra and various other deities, Lord Vishnu appeared in the form of Vamana, a dwarf Brahmin as his 5th incarnation. The King greeted the brahmin and told him that he will grant whatever he will wish for. In the form of Bhiksha (alms), Lord Vamana asked for 3 pieces of land measured by his feet. Listening to this, King Mahabali agreed to give this much space to the dwarf brahmin. To this, Vamana grew huge in size and took a gigantic form. With the placement of first feet, he covered the entire earth, with the second feet, he conquered all the heavenly places. There was no place left for placing the third feet by Lord Vamana. By realizing that the dwarf Brahmin is none other than Lord Vishnu, King Mahabali offered his own head so that Lord Vamana can place his third feet. Therefore, the King got defeated and was sent to the Patal Loka. What are the Rituals of Vamana Jayanti? On the sacred day of Vamana Jayanti, the most ideal way to initiate the rituals is by donating curd, rice, and food to the Brahmins as it is regarded as highly auspicious on the day of Vamana Jayanti. To please Lord Vishnu, devotees also observe a fast for the day as well as perform the puja and other rituals. Vishnu Sahasranama and various other mantras are recited. While reciting the name of Lord Vishnu for 108 times, devotees offer incense sticks, lamps, and flowers to the deity. The devotees listen to the Vamana Katha in the evening and then after offering prayers and bhog to the deity, they distribute the prasad to the devotees.